Not to be confused with Wilburn K. Ross. Wilbur Louis Ross Jr. (born November 28, 1937) is an American investor and the current United States Secretary of Commerce. On November 30, 2016, then-President-elect Donald Trump announced that he would nominate Ross for that post. On February 27, 2017, the Senate confirmed him in a 72–27 vote. He was sworn into office on February 28, 2017. Before he was appointed, Ross was a banker known for restructuring failed companies in industries such as: steel, coal, telecommunications, foreign investment and textiles and who specialized in leveraged buyouts and distressed businesses. In February 2017, Forbes magazine reported that Ross has a net worth of $2.5 billion. However, financial disclosure forms Ross filed after his nomination for Secretary of Commerce showed less than $700 million in assets, and Forbes removed him from their billionaires list in November 2017. He is often called the "King of Bankruptcy" because of his record of buying bankrupt companies, primarily in the manufacturing and steel industries, and later selling them for a large profit after operations improve. In November 2017, leaked documents known as the Paradise Papers showed that Ross had failed to clearly disclose a financial interest in a Russian company during his confirmation hearings. During the 2018-2019 U.S. federal government shutdown, Ross was widely criticized for making comments perceived as being out of touch with average American citizens after expressing bewilderment on CNBC about why furloughed, unpaid workers and contractors would choose to visit food banks rather than apply for a personal loan. In February 2019 it was reported that Ross' financial disclosure was rejected by the United States Office of Government Ethics after reporting he sold bank stock that other reports indicate he did not sell on his annual financial disclosure. 2.2.2 WL Ross & Co.
Ross was born on November 28, 1937, in Weehawken, New Jersey, and grew up in nearby North Bergen. His father, Wilbur Louis Ross Sr., was a lawyer who later became a judge, and his mother, Agnes (née O'Neill), was a school teacher. Ross drove two hours a day from New Jersey to attend the Catholic college preparatory Xavier High School in Manhattan. He ran track and was captain of the rifle team. He received his bachelor's degree from Yale College, his father's alma mater. At Yale, Ross edited one of the literary magazines and worked at the radio station. Initially, he wanted to be a writer, but after his experience in a fiction class requiring 500 words daily, he concluded that he had "run out of material." His faculty adviser at Yale helped him get his first summer job on Wall Street. He earned his MBA degree at Harvard Business School. After obtaining his MBA from Harvard, Ross launched his career, working for money-management firms and investment banks. In the late 1970s, Ross began his 24-year employment with the New York City office of N M Rothschild & Sons, where he ran the bankruptcy-restructuring advisory practice. In the 1980s, Donald Trump was in financial trouble. His three casinos in Atlantic City were under foreclosure threat from lenders. Ross, who was then the senior managing director of Rothschild Inc., represented investors in the casino. Along with Carl Icahn, Ross convinced bondholders to strike a deal with Trump that allowed Trump to keep control of the casinos. Ross's private equity fund, WL Ross & Company, was created in April 2000. He had started a $200 million fund at Rothschild to invest in distressed assets. As the U.S. bubble began to burst, he decided he wanted to invest more and advise less. In 2000, the 62-year-old banker raised $450 million to buy out the fund from Rothschild and make further investments in distressed assets. The new firm was named WL Ross & Co. In 2003 investment committee was composed of David H. Storper, David L. Wax, Stephen J. Toy, and Pamela K. Wilson, a J.P. Morgan & Co. veteran. In 2006 Ross sold WL Ross & Co. to Invesco, then Amvescap. WL Ross operates as a subsidiary of Invesco. In August 2016, Ross agreed to reimburse investors $11.8 million and pay a fine of $2.3 million to settle a Securities and Exchange Commission probe into the overcharging of fees by WL Ross & Co. The company had self-reported the issue to the SEC and did not admit any liability. According to Bloomberg Businessweek, by January 2016, WL Ross & Co. was the "biggest investor" in "Navigator Holdings, a liquefied gas shipping company." In December 2017, Irish politician and Member of the European Parliament Luke Ming Flanagan accused Ross of insider trading from WL Ross, as part of a 2014 sale of shares in the Bank of Ireland. In 2002, Ross founded International Steel Group after purchasing the assets of several bankrupt steel companies. Ross had support from the local steelworkers union, negotiating a deal with them to "save" Pennsylvania's steel industry. Leo Gerard, international president of the United Steelworkers union stated about Ross that "he was open and accessible and candid and honest and he put a lot of money back into the mills, so literally tens of thousands of jobs were saved." Ross sold International Steel Group to Mittal Steel Company for $4.5 billion, half in cash and half in stock, in April 2005. Ross combined Burlington Industries and Cone Mills in 2004 to form International Textile Group. ITG operates five businesses, all of which operate under separate brand names: Cone Denim, Burlington Apparel Fabrics, Home Furnishings, Carlisle Finishing and Nano-Tex. In 2005, Ross purchased 77.3% of Safety Components International for $51.2 million. In 2006, Ross merged the firm into his International Textile Group. In February 2014, Ross paid $81 million to settle a lawsuit brought by shareholders that Ross breached his fiduciary duty when structuring the merger of two companies that he majority-owned: Safety Components International Inc. and International Textile Group Inc. International Textile Group was sold to private equity firm Platinum Equity in 2016.
International Automotive Components Group was formed in 2006 by Ross and investment funds managed by Franklin Mutual Advisers. In 2006, International Automotive Components Group purchased the European operations of Lear Corporation. In 2005–2007, IAC purchased several divisions of Collins & Aikman. In September 2005, investors led by Ross made a $100 million investment in Oxford Automotive in exchange for approximately 25% of the company. In 2006, Oxford merged with Wagon Automotive. Ross founded the International Coal Group in 2004, which was formed after several coal companies went bankrupt. The United Mine Workers of America protested the bankruptcy reorganization as it led to changes in health care and pensions for the existing employees. The Sago Mine disaster was a 2006 explosion in a coal mine indirectly owned by International Coal Group that led to the deaths of 12 miners. Federal investigators said a lightning strike was the most likely ignition source for the blast. Following the disaster, the New York Post's Roddy Boyd reported that the mine had 12 roof collapses in 2005, and that the U.S. Department of Labor data showed 208 citations for safety violations in that same period, including 21 times for build-up of toxic gases. Miners and their families accused Ross of ignoring safety violations. Ross defended his company's management of the mine. Arch Coal purchased International Coal Group for $3.4 billion in 2011. In August 2018, Forbes reported that there was a "pattern" of allegations that Ross grifted his business partners and workers. A number of individuals had accused Ross of illicitly siphoning or stealing funds worth millions of dollars. The allegations of grift combined into a total of $120 million. On November 24, 2016, the Associated Press reported that Trump would nominate Ross to become United States Secretary of Commerce. The Trump transition team confirmed this on November 30 and on February 27, 2017, he was confirmed by the United States Senate in a 72–27 vote. Ross took office at the age of 79, making him the oldest first-time cabinet appointee in U.S. history. The previous record-holder was Philip Klutznick, who took office at the age of 72. Ross stated in an interview with CNBC that his priorities as Commerce Secretary were to be reducing the United States's trade deficit and working with private companies on infrastructure. In May 2017, Ross accompanied Trump on his first foreign visit, to Saudi Arabia where he generated controversy after heralding the president's visit as a success due to a lack of protests, unaware that the Kingdom had banned public protest and demonstrations in 2011. In 2017, Ross said that a trade deal with the United Kingdom was a low priority for the Trump administration; however, he outlined possible terms and blamed the European Union for making a deal with the United Kingdom more difficult. Under Ross, the Department of Commerce has recommended to President Donald Trump an increase of tariffs in aluminum and steel imports. President Donald Trump declared on March 1, 2018 a 25% tariff on steel and a 10% tariff on aluminum imports. In September 2017 Ross traveled to Beijing as part of efforts to reduce rising trade tensions between the two countries. Ross said that the tariffs imposed on Chinese goods are meant to "modify China's behavior." Ross led the first-ever U.S. Certified Trade Mission to Kazakhstan in October 2018. The mission included 16 U.S. companies that concluded commercial deals with the Kazakh businesses during the visit. Ross met with the President of Kazakhstan, Nursultan Nazarbayev, and other high-ranking officials. 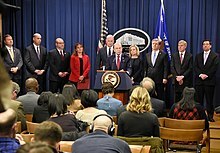 In January 2019, Ross was present with other American politicians when 23 criminal charges were announced against Chinese tech giant Huawei and its CFO Meng Wanzhou (including financial fraud, money laundering, conspiracy to defraud the United States, theft of trade secret technology, wire fraud, obstruction of justice and sanctions violations). In June 2018, it was revealed that Ross had failed to divest from his financial holdings, contradicting Ross's November 2017 promise in writing to the Office of Government Ethics that he had divested all his financial holdings. According to Forbes, Ross may have broken the law in doing so. An investigation by Forbes found that Ross, while secretary of commerce, owned for most of 2017 "stakes in companies co-owned by the Chinese government, a shipping firm tied to Vladimir Putin's inner circle, a Cypriot bank reportedly caught up in the Robert Mueller investigation and a huge player in an industry Ross is now investigating." Rather than divest from all the financial holdings, he put some of them in a trust for his family members. These holdings posed a conflict of interest for Ross, as the Trump administration was in a position to affect the value of the holdings. While Commerce Secretary, Ross shorted at least five stocks. In June 2018, it was revealed that Ross shorted stocks in one of the firms before reporting emerged that would likely adversely affect the stock and then he sold the stocks at substantial profit after the story was published. Ross knew in advance that reporters were preparing a potentially negative story. Ethics experts said that the shorting was alarming given that federal office-holders are prohibited from profiting on nonpublic information. Ross denied that he had engaged in insider trading. That same month, it was also reported that Ross had shorted stocks in two additional firms. In July 2018, it was reported that Ross had shorted stocks in two more firms. In July 2018, it was reported that Ross had failed to divest from a stock, though having previously agreed to do so at a specific date. According to an ethics agreement made by Ross, he was supposed sell his Invesco Ltd. stock, valued at between $10 and $50 million, within 90 days of his Senate confirmation. As Ross was confirmed by the Senate in late February 2017, he was supposed to sell the stock before the end of May 2017. However, Ross did not sell the stock until December 2017, during which time the stock's value had increased by between approximately $1.2 million to $6 million since May. Ross said that he "mistakenly believed that all of my previously held Invesco stock was sold". On July 13, Ross announced that he will sell all of the remaining stock he holds after he received a letter from the government's top ethics watchdog warning of "potential for a serious criminal violation." On August 7, 2018, in a follow-up story by Forbes, five former WL Ross & Co. employees and investors claimed the firm was charging its investors on money it had lost, including allegedly charging fees on one investment that was essentially worthless. In October 2018, documents showed that Ross had participated in a meeting with Chevron executives where they discussed oil and gas developments, tax reform and trade issues. Ross's wife owned a stake in Chevron worth at least $250,000 at the time. When Wilbur Ross was nominated as Secretary of Commerce in November 2016 he already had powerful opinions of the U.S. Census. As Secretary of Commerce, Ross oversees the census and approved adding the controversial question of citizenship on the 2020 United States Census. The Supreme Court sided with Ross and the Trump Administration by agreeing to block the questioning about Ross's decision of moving forward with the citizenship question on the 2020 census. As a result, the November 2018 scheduled trial on the census citizenship question was postponed because of the controversy. Moving forward, the New York attorney general, Barbara Underwood, is leading a lawsuit filed by 18 states and many cities to attempt to stop the Trump administration from adding a citizenship question on the 2020 Census. The Department of Justice is arguing against this because they are under the impression that this trial will be useless and wasting the government's resources because the Supreme Court may eventually rule in favor of the government. U.S. District Jesse M. Furman ruled against the Department of Justice and Wilbur Ross, stating that if the trial is delayed that the appeals process may not be done by summer 2019, the printing deadline of the census. Furman blocked the census question proposal on January 15, 2019, saying Ross had violated a "veritable smorgasbord" of federal rules, asserting Ross and his aides made false or misleading statements under oath. In a March 14, 2019 hearing, where Ross was questioned about his conversations regarding the adding of a citizenship question to the census surveys, which he had with immigration hardliners Kris Kobach, Steve Bannon, and Jeff Sessions, Missouri Democratic Representative Lacy Clay, accused Ross of being "complicit" regarding his efforts to weaken minority group voting rights, accusing him of committing perjury. He called for Ross to tender his resignation, saying, "You lied to Congress. You misled the American people and you are complicit in the Trump administration's intent to suppress the growing political power of the non-white population." 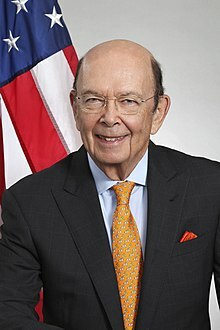 In November 2017, Paradise Papers reporting found that after becoming Secretary of Commerce, Ross held a stake (via a chain of offshore investments) in Navigator Holdings, a shipping company he once controlled which transports petrochemicals for Russian gas and petrochemicals company Sibur. Sibur has American sanctions against it for its close ties to Russian oligarchs Leonid Mikhelson and Gennady Timchenko, and President Vladimir Putin's son-in-law Kirill Shamalov. He had failed to clearly disclose these ties to Russian interests during his confirmation hearings. While his confirmation was pending, Ross promised in a letter to the Office of Congressional Ethics to cut ties "with more than 80 financial entities in which he has interests". This letter played a key role in securing his confirmation. However, according to the leaked documents, while he did divest some holdings, he did not disclose the full extent of those he retained. Senator Richard Blumenthal accused Ross of misleading the Senate Committee on Commerce and the American people by giving the impression that he had divested entirely from Navigator and by not disclosing Navigator's ties to the Kremlin. Blumenthal called for an investigation by the inspector general of the Commerce Department. Ross denied wrongdoing and said that he had declared his financial interests in early 2017 prior to his confirmation hearing. Speaking about his financial ties to Navigator, Ross said the media was making "a lot more out of it than it deserves" and "There is nothing wrong with it. The fact that it happens to be called a Russian company doesn't mean there is any evil in it." In 1999, Ross was awarded the Order of Industrial Service Merit medal by South Korea's President Kim Dae Jung for his assistance during the 1998 Korean financial crisis. Ross began working with Ireland and Irish-American causes starting in 2011 with an investment in the then-struggling Bank of Ireland. In recognition for his efforts on November 6, 2014 Ross was awarded the American Irish Historical Society Gold Medal at the Waldorf Astoria Hotel, New York. The medal is awarded to "individuals who make an especially meritorious contribution to Irish American Life". Ross was awarded the medal of the Order of the Rising Sun, Gold and Silver Star by Japanese Ambassador Sumio Kusaka on behalf of the Japanese government at Kusaka's New York residence on February 2, 2015. This was in recognition for strengthening the bonds between Japan and the US (including his service as Chairman of the Board of New York's Japan Society, which had begun in 2010 after being on its board of directors since 2005), his work to promote and strengthen the Japanese economy, and his relief efforts after the 2011 Tōhoku earthquake and tsunami. Ross is a hall of fame member and past director of the Turnaround Management Association. Since 2014, Ross has been the vice-chairman of the board of Bank of Cyprus PCL, the largest bank in Cyprus. As of January 2012, Ross was the leader (or "Grand Swipe") of the secret Wall Street fraternity, Kappa Beta Phi. He served on the board of trustees of the Brookings Institution. He is also on the board of advisors of Yale School of Management. He donated $10 million for the construction of Evans Hall at the Yale School of Management. Ross has been on the Board of Directors of Navigator Holdings since March 2012. Ross was raised as a Democrat. He served under U.S. President Bill Clinton on the board of the U.S.–Russia Investment Fund. Later, under New York City Mayor Rudy Giuliani, Ross served as the Mayor's privatization advisor. In January 1998 he put $2.25 million in seed money into the campaign of his then-wife, Betsy McCaughey Ross, who was seeking the Democratic nomination for Governor of New York. Although he was an early supporter of Donald Trump's presidential campaign, Ross was previously a registered Democrat, served as an officer of the New York State Democratic Party, and held fundraisers for Democratic candidates at his apartment in New York City. Since at least 2011, Ross has been donating to Republican candidates and organizations. He became a registered Republican in November 2016. On foreign trade, Ross has described himself as "pro-sensible trade" and said that the U.S. government "should provide access to our markets to those countries who play fair, play by the rules and give everybody a fair chance to compete. Those who do not should not get away with it – they should be punished." Initially in favor of the Trans-Pacific Partnership, Ross has said that after examining the agreement, he found it was "not consistent with what was advertised." In 2004, The Economist described Ross's views as protectionist. Germany's chancellor Angela Merkel has also voiced concerns during 2018 World Economic Forum in Davos over Ross and the Trump administration views as "not the proper answer". Ross, at the 2018 World Economic Forum, responded to concerns by noting that "There have always been trade wars. The difference now is U.S. troops are now coming to the ramparts." Ross married Judith Nodine in 1961. They divorced in 1995. Together, they had two children, Jessica and Amanda. In 1995, he married his second wife, New York Lt. Governor Betsy McCaughey. They divorced in 2000. On October 9, 2004, Ross married his third wife, Hilary Geary, a society writer for Quest magazine. Ross owns an art collection valued at $150 million that includes pieces ranging from Western surrealists to contemporary Eastern sculptures. Ross owns 25 works by René Magritte, valued at $100 million, including some of the artist's most valuable paintings, such as The Pilgrim. ^ a b "The Case Of Wilbur Ross' Phantom $2 Billion". Forbes. Retrieved November 7, 2017. ^ Boak, Josh (November 24, 2016). "Trump taps billionaire investor Ross for commerce secretary". Associated Press. Archived from the original on November 25, 2016. Retrieved November 25, 2016. ^ Zarroli, Jim (November 30, 2016). "Trump Taps Billionaire Investor Wilbur Ross For Commerce Secretary". NPR. Retrieved November 30, 2016. ^ Egan, Matt (February 27, 2017). "Wilbur Ross approved by Senate as Trump's commerce secretary". CNNMoney. Retrieved February 28, 2017. ^ Alexander, Dan. "The Case of Wilbur Ross' Phantom $2 Billion". ^ John Parkinson (January 18, 2017). "'King of Bankruptcy' Wilbur Ross Grilled on Trade, Climate Change and Infrastructure During Confirmation Hearing". ABC News. ^ a b "Wilbur L. Ross". International Consortium of Investigative Journalists. November 5, 2017. Retrieved November 5, 2017. ^ a b c "Leaked documents show Trump aide concealed ties to Putin cronies". NBC News. ^ Lynch, David J. (January 24, 2019). "Wilbur Ross says furloughed workers should take out a loan. His agency's credit union is charging nearly 9%". Washington Post. Retrieved January 25, 2019. ^ Rogers, Katie (January 24, 2019). "A â€˜Let Them Eat Cakeâ€™ Shutdown? Democrats Make the Most of an Administrationâ€™s Missteps". The New York Times. ISSN 0362-4331. Retrieved January 25, 2019. ^ "Wilbur Ross' Financial Disclosure Rejected by Office of Government Ethics". TheDailyBeast.com. February 19, 2019. Retrieved February 22, 2019. ^ a b c d e f g Gross, Daniel (8 November 2004). "The Bottom Feeder King". New York Magazine. 37 (39): 22. Archived from the original on November 30, 2016. Retrieved November 22, 2016. ^ Newman, Richard. "Community spirit – takeover maestro Ross eyes North Jersey banks", The Record (Bergen County), August 16, 2010, backed up by the Internet Archive as of May 10, 2017. Accessed July 4, 2018. "Ross, who grew up in North Bergen, has earned a reputation as a crafty investor and consolidator of bankrupt companies in struggling industries such as textiles and steel.... Ross is no stranger to New Jersey. He grew up in North Bergen, the son of a lawyer and a schoolteacher, and his family spent summers at the Jersey Shore in Spring Lake, where his sister and brother-in-law live." ^ "Commerce Secretary Wilbur Ross Reviews His Department's Domestic and Global Responsibilities", The Economic Club of Washington, D.C., July 25, 2017. Accessed July 4, 2018. "Secretary Ross: Well, yeah, I actually grew up in North Bergen. North Bergen was too small a town to have a hospital, so that's why I was born in Weehawken, yes." ^ a b c d Byrnes, Nanette (December 22, 2003). "Is Wilbur Ross Crazy?". Bloomberg Businessweek. Archived from the original on January 27, 2017. Retrieved November 5, 2017. ^ a b c "What You Need To Know About Commerce Secretary Pick Wilbur Ross, Trump's Billionaire Pal". Fortune. November 20, 2016. ^ Collins, JC. "How Rothschild Inc. Saved Donald Trump". PhilosophyOfMetrics.com. Retrieved November 22, 2016. ^ "Company Overview of WL Ross & Co. LLC". Capital Markets. Bloomberg Businessweek. November 5, 2017. Retrieved November 5, 2017. ^ Benner, Katie. "Wilbur Ross Sells Out". The Street. Retrieved October 8, 2014. ^ Josh Kosman (August 25, 2016). "SEC slaps Wilbur Ross for misallocating fees". The New York Post. ^ Abelson, Max (January 26, 2017). "Wilbur Ross and the Era of Billionaire Rule: The Commerce pick is key to Trump's experiment in government by – and possibly for – the ultrawealthy". Bloomberg Businessweek. Retrieved November 5, 2017. ^ "European Parliament Report Accuses Wilbur Ross of Insider Trading". Mother Jones. December 12, 2017. ^ Arnold, Chris (December 14, 2016). "Wilbur Ross: The Best Commerce Secretary Pick Dems Could Hope For?". NPR. ^ Kosman, Josh (October 8, 2014). "Wilbur Ross Sells Out". The New York Post. ^ "Wilbur Ross Buys 77.3% of Safety Components International from Zapata Corp. for $51.2 Million" (Press release). PR Newswire. September 26, 2005. ^ "International Textile Group, Inc. and Safety Components International, Inc. Announce Agreement to Combine" (Press release). PR Newswire. August 30, 2006. ^ Benjamin Horney (February 20, 2014). "$81M Settlement In Wilbur Ross Merger Case Wins Initial OK". ^ "International Textile Group Acquired By Platinum Equity" (Press release). PR Newswire. October 24, 2016. ^ "Wilbur Ross-backed International Automotive Components files for $115 million IPO". Reuters. June 14, 2013. ^ "Lear Corp. working on IAC deal with W.L. Ross". Plastics News. December 4, 2006. ^ "Ross completes deal for Collins & Aikman operations". Automotive News. October 12, 2007. ^ "Wilbur Ross-Led Investors To Provide Oxford Automotive USD $100 Million of New Equity" (Press release). PR Newswire. September 15, 2005. ^ "Oxford Automotive, Wagon merge". Automotive News. March 20, 2006. ^ James Dao (October 24, 2004). "Miners' Benefits Vanish With Bankruptcy Ruling". The New York Times. ^ Restuccia, Andrew; Palmer, Doug (November 15, 2016). "Billionaire investor Ross said to be Commerce pick". Politico. Retrieved May 19, 2017. ^ Boyd, Roddy. "N.Y. Exec knew of problems: Ex-Honchos". New York Post (January 5, 2006). ^ Mallin, Alexander (February 27, 2017). "Commerce Secretary Wilbur Ross: Everything you need to know". ABC News. Retrieved May 19, 2017. ^ "Arch Coal Completes Acquisition of International Coal Group" (Press release). June 15, 2011. ^ a b c Alexander, Dan. "New Details About Wilbur Ross' Business Point To Pattern Of Grifting". Forbes. Retrieved August 10, 2018. ^ Katkov, Mark (February 28, 2017). "Wilbur Ross Is Confirmed As Commerce Secretary". NPR. Retrieved May 19, 2017. ^ Strock, Ian (2016). Ranking the Vice Presidents. Skyhorse. ISBN 978-1631440618. ^ "US Commerce Secretary Wilbur Ross Explains Trade Plans". Yahoo Finance. Retrieved February 17, 2018. ^ Disis, Jill (May 22, 2017). "Wilbur Ross praises absence of protest in Saudi Arabia, where protests are illegal". CNNMoney. Retrieved February 17, 2018. ^ Pramuk, Jacob (May 22, 2017). "Wilbur Ross is happy that the Saudis didn't protest Trump – but he misses a critical point". CNBC. Retrieved February 17, 2018. ^ "Subscribe to read". Financial Times. September 7, 2017. Retrieved February 17, 2018. ^ Charlotte England. "White House: Trade deal with UK low priority after Brexit". The Independent. Retrieved July 18, 2017. ^ "Commerce recommends major tariffs on steel and aluminum". Axios. Retrieved March 1, 2018. ^ "Trump's top trade advisors want to slap a new tax on steel imports, which could lead to a trade war". Business Insider. Retrieved March 1, 2018. ^ "Trump declares his trade war: targets steel, aluminum". Axios. Retrieved March 1, 2018. ^ "U.S. Commerce Secretary Ross tells China to guarantee fair treatment for U.S. firms". Reuters. Reuters. September 26, 2017. ^ "Commerce Secretary Wilbur Ross: China is 'out of bullets' to retaliate against Trump's new tariffs". Yahoo News. September 18, 2018. ^ "U.S. Commerce Secretary, business delegation tour Kazakhstan". astanatimes.com. ^ a b c d e f Alexander, Dan. "Lies, China And Putin: Solving The Mystery Of Wilbur Ross' Missing Fortune". Forbes. Retrieved June 18, 2018. ^ a b c Mangan, Lori Ann LaRocco, Dan (July 2, 2018). "Wilbur Ross says he shorted two more stocks during his time as Commerce secretary". CNBC. Retrieved July 4, 2018. ^ a b "Commerce Secretary Shorted Stock as Negative Coverage Loomed". Retrieved June 20, 2018. ^ "Commerce chief denies transactions involved insider trading". AP News. Retrieved June 20, 2018. ^ "Wilbur Ross stock holdings rose in value during improper divestment delay". Center for Public Integrity. Retrieved July 5, 2018. ^ Giles Snyder (July 13, 2018). "Criticism from Ethics Watchdog Leads Commerce Secretary Ross To Sell Remaining Stocks". NPR.org. Retrieved July 13, 2018. ^ Alexander, Dan (July 8, 2018). "New Details About Wilbur Ross' Business Point To Pattern Of Grifting". www.Forbes.com. ^ Alexander, Dan. "Wilbur Ross Scheduled Meetings With Chevron, Boeing Despite Conflicts Of Interest". Forbes. Retrieved November 5, 2018. ^ "Commerce Secretary Grew Impatient Over Census Citizenship Question, Emails Reveal". NPR.org. Retrieved October 26, 2018. ^ Lejeune, Tristan (October 24, 2018). "Administration asks judge to delay trial on census citizenship question". TheHill. Retrieved October 26, 2018. ^ a b https://www.facebook.com/tarabahrampour. "Judge declines to grant stay in census citizenship trial". Washington Post. Retrieved October 26, 2018. ^ Wines, Michael (January 15, 2019). "Court Blocks Trump Administration From Asking About Citizenship in Census" – via NYTimes.com. ^ Democrats accuse Wilbur Ross of voter suppression in hearing on 2020 census citizenship question, CBS News, Camilo Montoya-Galvez, March 14, 2019. Retrieved April 25, 2019. ^ a b Mike Mcintire, Sasha Chavkin and Martha M. Hamilton (November 5, 2017). "Commerce Secretary's Offshore Ties to Putin 'Cronies'". The New York Times. Retrieved November 5, 2017. Wilbur Ross, the commerce secretary, retained investments in a shipping firm with business ties to Russian President Vladimir V. Putin's inner circle. ^ "'Paradise Papers' documents touch Trump administration". Politico. Retrieved November 6, 2017. ^ Harding, Luke; Swaine, Jon (November 6, 2017). "Wilbur Ross denies wrongdoing after Paradise Papers leak". The Guardian. Retrieved November 27, 2017. ^ "Biography of Wilbur L. Ross, Jr". University of Pennsylvania, Wharton. ^ James Walsh (October 8, 2014). "Wilbur L. Ross, Jr. honored by the American Irish Historical Society". ^ "Wiblur Ross '55". Xavier Magazine. September 30, 2015. p. 17. ^ Marshall Heyman (February 3, 2015). "A Japanese Knight? Well, Close Enough". The Wall Street Journal. ^ "The Order of the Rising Sun, Gold and Silver Star – Wilbur L. Ross, Jr., Chairman, Japan Society". Consulate General of Japan in New York. ^ Susan Miyagi Hamaker (February 7, 2015). "Japan Society Chairman Honored by Japanese Government". Japan Culture NYC. ^ "Turnaround, Restructuring, and Distressed Investing Industry Hall of Fame". New York. ^ "Wilbur L. Ross, Jr (Vice-Chairman) – Bank of Cyprus Group". bankofcyprus.com. Retrieved February 28, 2017. ^ Roose, Kevin. "One-Percent Jokes and Plutocrats in Drag: What I Saw When I Crashed a Wall Street Secret Society". New York. Retrieved February 19, 2014. ^ "Board of Trustees". Brookings. Retrieved December 20, 2016. ^ "Three Yale alums among Trump's Cabinet picks". December 5, 2016. ^ a b c d Daniel Gross. "The Bottom-Feeder King". New York. ^ "Yale School of Management | Educating Leaders for Business and Society". Mba.yale.edu. November 18, 2016. Retrieved November 24, 2016. ^ "Trump Commerce Pick Ross Was Registered Democrat Until Mid-Nov". newsmax.com. November 30, 2016. Retrieved December 12, 2016. ^ "Mr Protectionism's riskiest call". The Economist. Retrieved March 1, 2018. ^ Elliott, Larry; Wearden, Graeme (January 24, 2018). "Protectionism is not the answer, Angela Merkel warns US". the Guardian. Retrieved March 1, 2018. ^ Ellyatt, Holly (January 24, 2018). "Wilbur Ross: Trade wars aren't new but 'US troops are coming to the ramparts'". CNBC. Retrieved March 1, 2018. ^ a b "Wilbur Ross Fast Facts". CNN. Retrieved November 24, 2016. ^ "Wilbur Ross | Department of Commerce". Commerce.gov. February 28, 2017. Retrieved June 8, 2017. ^ Cowan, Alison Leigh (October 17, 2004). "Weddings: Hilary Geary and Wilbur Ross Jr". The New York Times. Retrieved November 24, 2016. ^ a b Chen, Liyan (October 8, 2013). "Billionaire Art Collector Wilbur Ross Loves Magrittes, Paid $100 Million For His Own". Forbes. 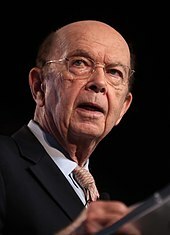 Wikimedia Commons has media related to Wilbur Ross. Stein, Nicholas (May 26, 2003). "Wilbur Ross Is A Man Of Steel... and textiles and optical networking and anything else in deep, deep trouble". CNN; Fortune. Gross, Daniel (January 16, 2003). "Is Wilbur Ross the next Andrew Carnegie?". Slate. Alexander, Dan (August 7, 2018). "New Details About Wilbur Ross' Business Point To Pattern Of Grifting". Forbes. This page was last edited on 25 April 2019, at 09:04 (UTC).